Mr & Mrs E asked us to undertake all the plumbing work in the extension they were planning for their 2-bedroom semi in the centre of Lymington. With Mrs E’s mother relocating from Devon to live with them, they needed to create a separate space which suited her now and in the future. At 85 years of age, this was an emotional move and one that needed to be right for them all, so it was important the family were confident we could tick all their boxes. Not a fan of showers, Mrs E’s mother had always taken baths, but realised that she would find it safer to shower, as long as it was easy to use and had additional features like hand rails. She was adamant though, that it didn’t look like an old people’s home with assistance rails everywhere. Our team suggested chrome rails and non-slip floor laminate to ensure the shower was safe and stylish. We installed the assistance rails straight, rather than at an angle, so they looked more like a towel rail, but still provide support when needed and additional features like; a ‘start’ button positioned outside the shower, so she didn’t get wet switching it on, an easily adjustable shower head, non-slip shower tray, extra handles inside the shower for assistance and an inset shelf for shower gels so she doesn’t have to bend down to pick them up off the floor. 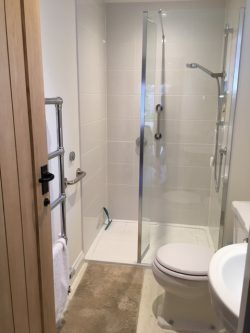 We installed two en-suite shower rooms and updated the family bathroom as part of the entire extension project, working alongside the family’s chosen builder, New Milton Construction who project managed the entire build, ensuring the client moved in ahead of the 7-month schedule. 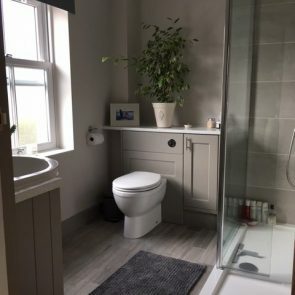 When it came to the upstairs en-suite shower room layout, we recommended a slight reconfiguration to maximise the space and made sure Mr E had the shower he wanted, and Mrs E had the storage space she needed. “We’re delighted with the plumbing and build. The Aqua Plumbing team were very efficient and so nice to have around.” Mrs E, Lymington.